You can save money this summer–as well as do something good for your kids–when you take the time to make your own popsicles! This is an easy, kid-friendly activity, and the result is a refreshing treat that is much better for you than the store-bought, sugar-filled alternative. There are quite a few ways you can approach this depending on the sales you find at your local store or the time you have. Try some of these easy, quick tips to filling your favorite popsicle molds (our favorites are the Tovolo Rocket Ship and Star ones pictured above). Puree fruits and juices: Puree any leftover fruits with juice, milk, or even leftover whey (from making Homemade Yogurt) and then pour it into your popsicle molds. Flavored Yogurts: If you find yogurt on sale, a great way to extend its life is to pop it in the freezer. I do this a lot with Gogurt’s or Horizon Organic’s Tuberz if I find them on clearance and need to make them last longer. Smoothie Recipes: We make smoothies a few times a week and I always have leftovers. So I pour those into popsicle molds so as not to waste any. Take any of the smoothie recipes below, (or create your own) and pour into a mold. Be sure to add extra liquids. You don’t need frozen fruits for this. It works best with fresh fruit and lots of juice/water/milk. 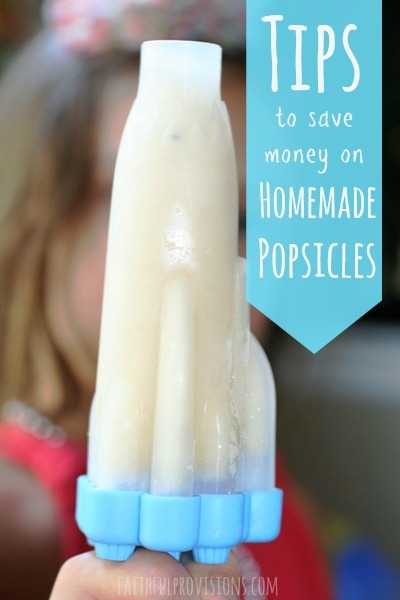 What are your favorite Homemade Popsicle ideas? Be sure to share them in the comments below.